I was saddened to hear today of the passing of Ian Gallahar. 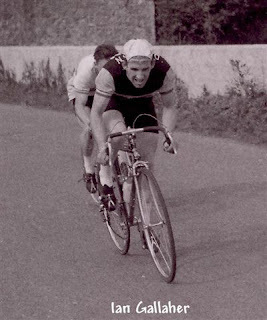 Ian was a long time member of the Dublin Wheelers CC, first as a rider and then as a distinguished organiser and Commissaire. I first met Ian as a kid because he was a friend of my Dads, but got to know him better when I started racing myself. Ian was one of those ever-presents on the Irish cycling scene, working hard to ensure races were run safely and efficiently. In recent years he was a highly respected Commissaire, applying the same steady hand regardless of whether the race in question was a high profile international event or a Tuesday evening Park Gallop. He really was an unsung hero of the sport and will be sadly missed. RIP.